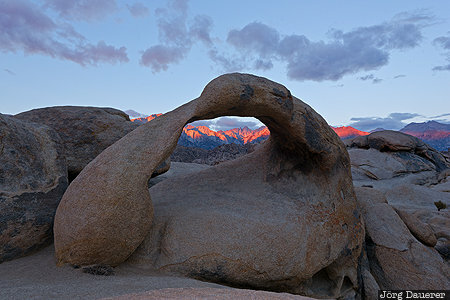 The first light of the creates alpenglow on the peaks of the Sierra Nevada with Mount Whitney in the center with the natural arch Mobius Arch in the foreground. Mobius Arch is in the Alabama Hills near Lone Pine in the east of California, United States. This photo was taken in the morning of a sunny day in October of 2016. This photo is part of the exhibition Natural Arches (June 2014). This photo was taken with a digital camera.